RELEASE...Quest Town "a small adventure game"
This is a small one level demo to show that you can make an adventure game with the WGR2 mod created by Deeper Thought. I originally released this as MedEvil and it was an unfinished beta version. This one is complete. There are 10 quests to complete. Completing them all is not required to finish the level. When you approach most non-moving villagers they will automatically talk to you. The walking villagers are different. Press the "use" button when they approach and they will say random things to you. If you see a villager with a yellow exclamation point above their head press the "use" button and they will talk and give you a quest to complete. When you find the item of that quest you can go back to them and press "use" again and if they have a reward for you it will be given at that time. You can press the "R" key any time to open and close a window that shows you your quests. Other features are contained in that window but were not used in this demo so ignore them. Quest items do not show in the window,a known bug. You do not have to complete one quest before starting another. A limitation here is that the quest item you need to find does not show in the map until the quest is given to the player. So you will end up having to go back to places you have already been earlier. This is an adventure game but I put in some limited fighting at the end after the quests are completed. 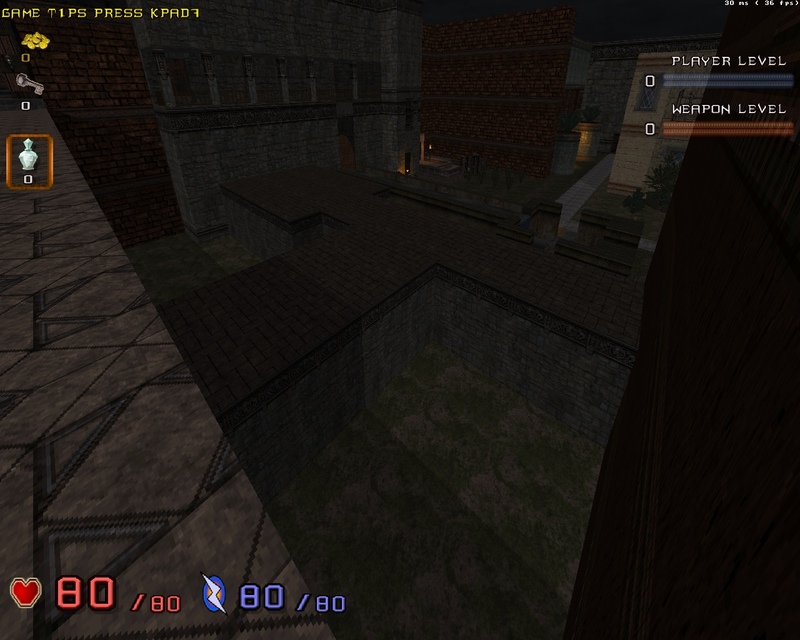 Its kind of a leftover area from way back when I was going to make this a shooter map. In keeping with a tradition for some humor in all my projects, I included one room with a bit of silliness in it. You'll know which one. It definitely does not belong in a medieval village. P.S. Some of you who have been around here for years might recognize that the map I used as a base for this was my abandoned Ancient Rome map. Unzip the 119mb QUEST TOWN file to a clean folder. Do not combine this with any other mods. Also make sure the Quest Town folder is NOT a subfolder of your Steam, Gog or World Tour folders. Some people had problems running some of my other projects when they were installed there. So I assume this would have the same issue. You do not need to copy your Duke3D.grp file into the folder to play this. Just click on the "WGR2MARK.bat" file to play. This was made to be played in Polymer but if your machine doesn't handle it well you can try Polymost. Obviously it won't look as good but it may be playable with a few minor glitches. I helped beta test this and I really enjoyed it. It's got your trademark humour and the quests are interesting. I know what you mean about the frame rate. I wasn't real worried because there was no fighting in those areas, just walking around. I'm glad you enjoyed it. Where you able to figure out all the quests? All Quests? Yeah, of course. Only lament, very little gold around. I hate poor towns, and cheap Kings. I would have to look around again to be sure but I think along with the gold out in the open there were at least 3 hidden places with gold too. I was relieved to hear you were able to do all quests. One I wasn't very sure of was feeding the Minotaur. Finding the food wasn't very logical. I forgot once again to give credit to my helpers. I can't edit the original post so doing it here will have to suffice. The TeaMonster family. Mr, Mrs, and daughter for providing some voices. Hank, Trooper Dan, Teamonster, they helped to convince me to finish the beta version I was going to abandon. And as usual, Trooper Dan and Mblackwell for answering my coding questions. If I forgot someone else, sorry, it was not intentional. Anyway - thanks, to and your and your team. Yep got around every quest! This is a great idea for future duke maps maybe? Doing quests like these maybe i different time era. Open city or maybe desserts something like you have seen in fallout. Enjoyed it allot! Good work! Thanks again. A lot of work went into this and its always good to hear someone liked it. I have a second medieval map built for this mod but I never got around to figuring out new characters or quests for it. Map wise I think it looks way cooler than this one. Already a new map Hehehe cool! Mostly i tried getting ideas from looking at tv series or movies and ofcourse games. Try looking in Skyrim maybe? Tv series like Game of Thrones or Lord of The Rings trilogy. With this map you gave me something to think about BTW the screens look promising! Haven't played it, just downloaded it and did a quick pass over the map, I'm amazed at how well Polymer is handling all the models, transparency glitches are gone and the polycount in some shots has got to be in the hundreds of thousands. Great use of the assets and lighting, it's a very good looking map. Yep. Lots of models and during the mapping process I reached the 16K wall limit 3 times. I had to delete areas I thought were weak and use that to build something better elsewhere. Thats also why there are a couple of areas that look like they could have been filled a little more. I ran out of walls. I suppose I should have taken advantage of the hub mapping feature of WGR2 and split the map. How did I miss this? I'll check this out some time next month after my Uni commitments have reduced. How could you have missed my huge marketing campaign? I'm almost certain commercials ran in prime time in your country. 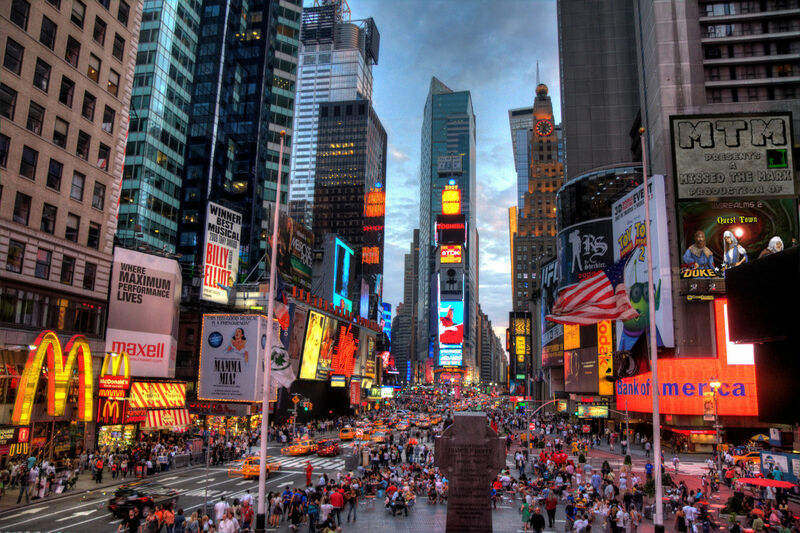 Here is a snap shot from Times-Square. As you can see, your billboard could be over looked, so maybe better adds in Down Under? I wanted to rent the center building spot but was it was double the price. Hey, did you find the time to play this yet? Is not exactty my genre, i had to play it 4-5 times before to understand how to proceed properly and kill the monsters (i got squished by the boat also lol). Many Npc are so greedy, so i had problems to find the money and get the weapon (maybe because i found only 1/4 secrets), then i've arranged myself and made the first Hexen's monster half-stacked downstairs, and kicked him dead. Some quest are quite funny, expecially the Minotaur one, i find it funny and a bit disgusting at the same time xD. The map is well made, there is just one spot (pretty obvious) where you can get stuck (i went there to search "the cat"), also i had some problems with the framerates in some places (with polymer), so i tried polymost, but become too dark to be played, however i did not tried classic. I placed more gold than you need but not by much. Maybe finding just 1 more secret place would have been enough. I thought I blocked the area you fell down into. I guess not. The TC was designed for Polymer but it plays with obvious minor glitches in Polymost. Software mode will screw up. That map uses almost all 16,000 walls allowed by the game so that is part of the slowdown. Keeping that in mind I made sure to keep the adventure part in the slower area and the fighting at the end was in an isolated area and framerate was better.